I have one big worry.. You sound optimistic about implementing a real-time galaxy. As a long time-Dwarf Fortress player, having seen most of my forts eventually die the FPS-death, I'm kinda worried that later in game, with a lot of races, all having a lot of assets, the game will slow down to a crawl. Also, for 4X games, I kinda like it turn based personally. It would be similar in implementation to the way it is now but with a more real time feel. For example, in Aurora if you set an increment size of one hour and a sub-pulse size of one minute and switch on automated turns, that isn't really any different than a 'real-time' system that increments one minute at a time. What I will probably aim for is the user setting a time-acceleration rate (so 60x for one minute increments) and also a 'frame rate', which will be how many increment pass before the map updates itself. For high-end systems you could set a one-to-one update rate so the map is updating more quickly than at the moment. For less capable systems you might set up a 10-1 update rate, so the map would only update after every ten increments, in which case it would function almost identically to Aurora. There would still be some form of interrupts, although I would be thinking about how to implement that from the start rather than trying to add it later as I did with Aurora. Basically, I would like to have motherships / space bases, with onboard production capabilities. One thing I will definitely want to accomplish is to decouple production from populations. I intend production to be linked to different types of 'production facilities', regardless of whether those are on planets or in space stations. I have to throw in my two cents here. I like a lot of the changes being proposed, from a game play perspective, and appreciate that this is a long term project which won't be coming out in the foreseeable future. That being said, I'd love to see this game be made accessible to the blind. The only reason Aurora is at all has a lot to do with its idiosyncrasies: being written in VB6 with mostly standard controls and all information being represented textually. I'm a bit unsure of the realtime pausable format. Logistically, realtime games have always been a bit harder to make accessible than turn-based ones, though it has been done: see SoundRTS, (http://jlpo.free.fr/soundrts), for an example. One feature which would help a great deal would be integration of Microsoft SAPI into the game interface to provide audio feedback. So I'm glad that we're looking at moving forward with a new game, but I'm also glad that Aurora itself will still be developed in the foreseeable future. I hope the blind community doesn't get left behind. I think my comment about real time may have given a false impression. I still don't intend to allow a command and conquer style interface where you command ships as they are moving. You will give orders while the game is 'paused', just as in Aurora, and then let it run until something happens, just as you currently do with automated turns. In effect I am making automated turns part of the normal function and removing the higher level increments while retaining the lower-level sub-pulses. The function will be internally very similar to the way it is now but the impression should be a smoother-flowing game. I don't know anything about Microsoft SAPI, although I have just taken a look at their website and it looks interesting. I'll take a proper look at it when I get more into the development. Thanks for the link. Non-area damage is easier and it would appear to be more realistic too, so I guess I will stick with the existing system. I don't know what math the current calculations for point-defense were based off of, but I figured this was worth passing along. The current math is based on internal consistency rather than real world physics and it seems to work well within the context of the game. I will take a look though. Thanks for the links. Finally, a suggestion for yet another factor in ship design: heat. Radiators would be an integral ship component, keeping the ship from cooking the crew alive with heat buildup due to engines and weapons. Easily damaged in combat though--and giving the ship a higher active scan signature (likely, a higher thermal signature as well) when deployed. You could have the option to retract them (to cut signature output and avoid losing them easily in combat), but too long and you'll start facing dangerous heat levels. Radiating armor could be a research option along the way; in the meantime, ensuring your ships have enough radiators or heat sinks to weather the loss of a few and/or be able to rapidly disperse the heat buildup from retracting them (so as to retract them again quickly and minimize detection), would be an important consideration. This is something I hadn't even considered, although the concept is interesting and a little similar to Battletech. My main concern would be the level of micromanagement on a per-ship basis. As for X-Ray Lasers, direct a strong X-Ray laser at a Meter of, say, steel. No need for futuristic materials that can bend the laws of space and time. After several hours, the piece of steel might have wear on it, but it will essentially still be a piece of metal well capable of surviving a hit with high explosives. Since the project RHO page about nukes and lasers has already been posted, I don't have to anymore. I'd recommend going there and reading up, it's really a great page (nuke powered X-ray lasers are somewhere in the middle of the page). So I hope the graphics and UI will be a lot nicer than Aurora but to be honest the graphics are not my priority. I perfectly understand that, and agree, but you don't NEED to do fancy graphics just because you're using a graphics engine. Apart from providing a flexible and fast environment for your GUI and the system display, it'll also do such annoying things like vector calculations, rotations etc. for you. I perfectly understand if you'd rather go with WPF for the GUI, I'm just saying that a graphics engine that already has a good GUI implementation could make a lot of stuff easier, and doesn't force you to go all shiny. They can draw vector graphics just as well as teh fancy lighting, and a lot faster than the WinGUI can. And if you want to go real-time display, you might need the speed. . .
Plus, you'd have Multi-Platform capability as a bonus. As for graphics, I think the best option would be to go for a symbollic style, the kind you'd see on large screen inside a comand bunker. Actually modelling ships would work against realism greatly due to the -giganormous- size of space. A system similar to what Aurora I has but with the addition of some hollywood-alike fanciness has the potentially to be beautiful while not being very time-intensive. Glowing vector graphics would do that nicely. Think something like this but without the starfield background. Or even with it, for that matter. It would probably go as far as selecting battlegroups on the system map by mouse-over and giving them orders by pressing somewhere in space, given it's two-dimensional. PS: If you go in this direction, why not also allow controlling of crew cycles etc, and moving seasoned crews to new ships, optional as overhauls? PPS: Given we've talked about Neutron Bombs now, shouldn't that include lower damage, but temporary EM? Like, Missiles effectively doing less permanent damage than now, but shutting down that CiWS for a few seconds or something? And Missiles having different effects based on atmosphere? Have you considered using XNA as an engine? As a graphics engine, I like it, and am using it for a 2d game I'm developing myself. It also has some good stuff around the edges to simplify building the game portions. An added bonus: you can still use windows forms and things with it, so you could have a resizeable system map window, and implement the controls and views and forms as either overlays on top of that, or have pop-out controls as windows forms or windows presentation foundation objects. By more control do you mean being able to give them a heading rather than a destination, or do you mean detail down to the level of turn rates and facing? Well, at a minimum course and speed, with destination based orders for strategic movement. Turn rates and facing, with associated blindspots would make a more interesting tactical game, but would also add a lot of complexity. I'm not too much a fan of XNA, but I have to agree that this would be a considerable advantage for a project like Aurora. You could even write in C# for it if I'm not terribly mistaken, which would mean Steve could catch several flies at once: Use his already written code, all the windows API and object-related stuff (like access and so forth, which I think has been heavily used in Aurora) AND have a graphics engine with a decent speed. . . I think this would indeed present an optimal solution that involves all factors that are currently in play. There's not much of an EMP by any nuke in a vacuum, I'm afraid. But a high enough concentration of neutrons would pretty much grill the crew while leaving the whole ship intact, which is certainly an interesting tactical option. I think if ground combat was developed further, adding a hex system on top of Aurora would be jarring - if the movement system for ships and so on was a hex system then yes it would be a good idea. If you were to develop the ground combat I would keep the same system used for space. Generate a random(?) map of terrain - it would only need an objective (colony/outpost etc) and areas of terrain if the are different from the norm (areas with more/less cover, movement penalties, impassible etc) and then move your unit designs around in the same way as you would any spacecraft. 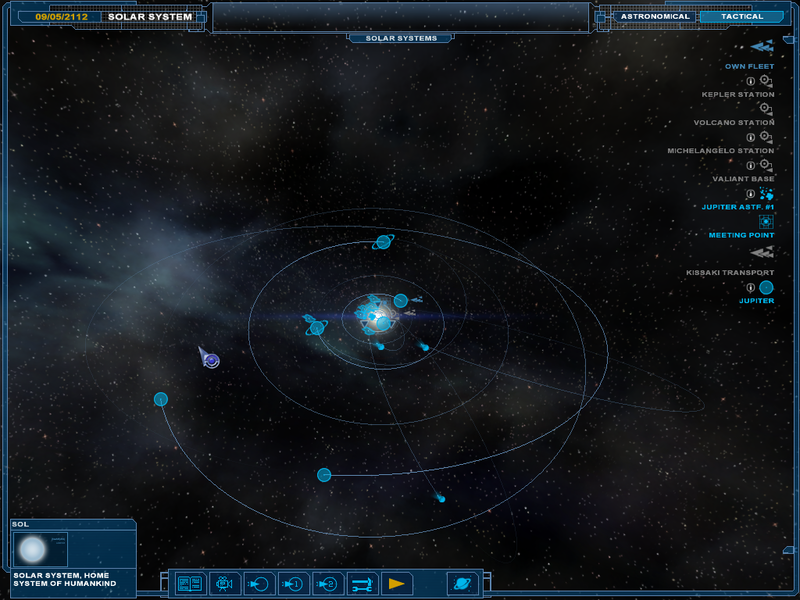 Keeps it simple and the same system used for both combats, the only difference is the addition of terrain modifiers. But, if you include that in the main game for instance certain asteroid types make it harder to detect ships within due to interferance, stars with high activity means ships can effectively hide if they are within 500k km and so on it would essentially be using the same code and for the players the same 'rules' for both types of combat. If its division scale combat then something along the lines of HoI would fit very nicely, not get too bogged down in minutae of movement/los etc and still give great scope for planetary campaigns. Economy! Like, a heavily industrialized planet importing food. On the strategy vs tactics and deciding on one or the other--I'd sooner leave things the way they are. If I want space tactical combat, I'll pick up Homeworld or a similar game. If I want strategy, there's Sins of a Solar Empire (or a slew of others). Aurora is the only game that lets me handle both strategy and tactics in the way I've desired to for years. When I get into combat, I can see how my strategy dictates the tactics available to me, and the results of that combat drive my overall expansion strategy. It's a beautiful thing that Aurora has and to throw that away seems a terrible waste. You say that like it's a problem. Look at our base distance measurement in Aurora. There'd still be plenty of room even in comparatively tight ship formations. Aurora I already has that to an extent, but I'd like to see this expanded, this might make conventional elements a relevant resource, with populations generating conventional resources similar to how they generate trade goods now, and not only have trade in those but actually have meaningfull shortages. This could mean either simply listing the periodic table, or listing them by application (Ie, fusion fuel, rare metals, etc. ), I can still imagine a hightech space hab would run into issues when the fuel supply runs out and they don't happen to be close enough to their parent star for solar power. I don't say it's a problem because of lack of space. After all, there's as much space in SPAAACE as you could ever wish for. I'm talking about mass. You could make the radiators a lot more lightweight than they are today, but the areas we're talking about would still easily pack a few thousand tons. Then, you might think about what a few square kilometers of radiators would do to the target cross-section. Add to that that you can't put armor on them for obvious reasons, and I'm sure you'll be able to see that they're not so good an Idea in a game like Aurora, especially if there ALREADY are enough mcguffins that can do the job (like, laser deflecting shields that can just as well deflect the exhaust). How about random things happening? Like "Financial Crysis" -10% political stability and production, -50% wealth Creation. Effects diminish over a half year. A suggestion I'd also give is to multiply some of the current values. Like, make ships have 10x as much armor, and weapons deal 10x as much damage. Allows for a lot finer damage templates, orbital combat, etc. And while were at it, Hull integrity. So a really big ship has to invest some hull spaces so it doesn't break apart if a big laser cuts straight through it. That will fight big ships being generally the best choice.